This time of year, I usually do a post where both my husband and I look through my past year of blogging and we each choose our favorite recipe from each month. However, 2016 was not a typical year for me, or the blog. Between a high-risk pregnancy, extreme meat and onion aversions, all day "morning" sickness, and then newborn twins, cooking and eating weren't always high on my list. Well, after the morning sickness passed, eating was *really* high on my list. I was never so famished in my life as I was while pregnant with twins! Thanks to all of you for sticking with me through my sparse posts this year. It's been a wonderfully exciting year. The babies are now about 5 months old and tons of fun. I am hopeful that I'll be able to ramp up my posts again in 2017. So this year we are both picking our "Top 6 of 2016" instead. These are our top picks, in no particular order, starting with me. I have to kick off my picks with these cookies because not only were they super tasty, they were how we told our family that we were expecting a boy and a girl! Did anyone else get one of those chocolate oranges every year in their stocking for Christmas? There was always one in their for me to dig out on Christmas morning when I was a kid. So, I always associate the flavor of orange + chocolate with the holidays. Sarah over at Fantastical Sharing of Recipes announced that this month's Fantastical Food Fight would be shortbread cookies. In the past I've made a couple shortbread cookies, including one of my all-time favorites - Rosemary Christmas Tree Shortbread Cookies. After thinking for a bit, I thought incorporating the chocolate and orange flavor I remember from my childhood stockings would be perfect! I was right. 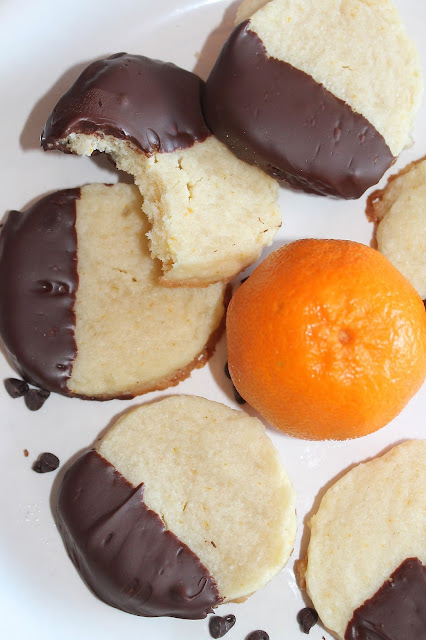 The buttery shortbread is brightened by the addition of fresh orange juice and zest and then given a boost of extra yumminess by being dipped in chocolate. They look pretty and taste great! I used these lemon shortbread cookies as a guide for this recipe. It will make approximately 2-1/2 dozen cookies. These cookies are a terrific addition to your holiday cookie platter! Don't forget to check out the bottom of this post for other shortbread cookie recipes. Sticky and sweet with a touch of heat, this stir fry is a flavorful and easy weeknight dinner. We get a half of a pig from a local farmer each year, so pork is somewhat of a staple in our meals. Oddly though, I don't feel like I really post all that many pork recipes. 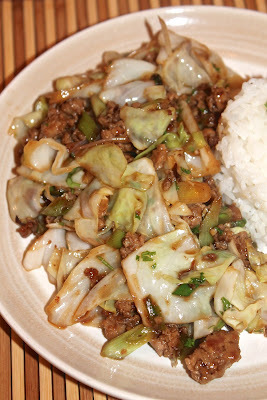 This stir fry is something I whipped up on a whim one night to use up some cabbage. We enjoyed it, so I made it a couple more times, tweaking the sauce and measurements. The sauce takes a few minutes to make, but then it all comes together relatively fast. This time of year I think we can all use some quick recipes to get dinner on the table (anyone else super behind on holiday preparations?!). Serve the stir fry with a side of white rice and this will serve about 3 people. 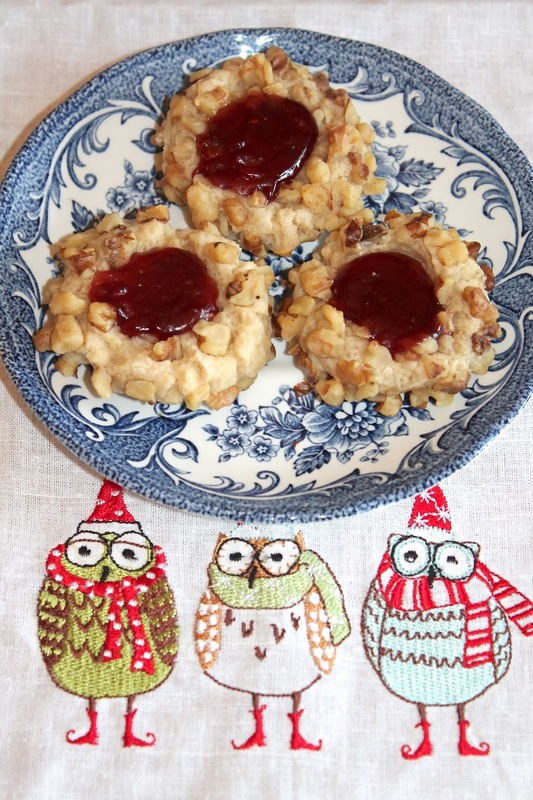 Thumbprints are a classic holiday cookie. I make them pretty much every year, but somehow they've escaped being posted on my blog. Probably because most people have a version of this recipe already. I mean, they are a popular cookie for Christmas for good reason. But, I think it's high time to share these on here! This recipe comes originally from my great-grandmother, handed down to us through my mother. I remember making and eating these cookies throughout my childhood. They definitely have a sentimental feel about them when I make them, when I place them out on a platter, and when I eat them. Her recipe is sparse - no mention of how much nuts to use - they aren't even listed in the ingredients. In the instructions, it just says "roll in nuts" and there's no mention of separating the eggs - I guess when you make them every year for your adult life, it's pretty intuitive! I have modified her recipe just a bit and made it a little clearer over the years. This recipe will make about two and a half dozen cookies. If you don't already make thumbprints for your holiday cookie tray, please add them. You wont be disappointed. We eat winter squash all fall and winter long in our home. We often get a bunch from my father-in-law's garden and we always get a big assorted basket the last day of our farmers' market. This makes winter squash a staple around here and I'm always coming up with new ways to enjoy it. This recipe is a modified version of my Cheesy Spaghetti Squash side dish. I upgraded to larger spaghetti squash, added some ham, and made a couple other changes to turn it into a main dish. This was so creamy and cheesy, but also full of vegetable goodness at the same time by using the spaghetti squash instead of something like pasta or rice. It may be a good way to get some pickier eaters to give spaghetti squash a try! This recipe will serve 2 adults as a main dish. It's easy to double though. It's also a terrific way to use up leftover ham, especially if you are making a ham for the upcoming holidays. I love recipes that re-purpose leftovers into something completely new.